Rising awards organization 10 Best PPC has listed the February 2016 winners of its Best Bing PPC Management Firm Awards recognizing outstanding industry work. Blue Matrix of Dallas, which also specializes in website design, came in first, followed by Web Talent Marketing of Lancaster, PA in second place and 7strategycom of Olathe, KS in the third spot. Recently, 10 Best PPC named Blue Matrix, Web Talent Marketing, and 7strategycom to the top tier of its 10 “Best Bing PPC Management Firm” list. The recognition is a result of measured excellence in the quality of each firm’s pay-per-click (PPC) services for clients that rely on Bing Ads to advertise their products and services. Part of the San Francisco-based 10 Best Network LLC, 10 Best PPC comprises a team of experts and professionals who have several years of experience in Internet marketing. The team uses a set criteria for measuring the efforts, expertise, and acclaim of PPC agencies and rank them accordingly. In this case, the agencies selected have proven their efficiency in advertising using the ad program of Bing, which is Microsoft’s search engine. Bing’s PPC advertising program competes directly with Google’s AdWords. 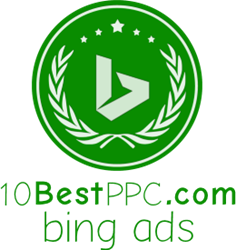 According to 10 Best PPC, Blue Matrix heads the top of the list of best Bing PPC management firms. Based in Dallas, Texas, the agency was built by a team of industry veterans who have more than 45 years of combined experience. More than just a PPC firm, Blue Matrix also works with clients who are looking for website design and development, brand development, cloud hosting services, social media marketing and management, search engine optimization (SEO), and even Google Plus services. Websites in particular are designed to be responsive, which means that they are optimized for aesthetics and functionality on any device. Blue Matrix’s clientele has included high-powered brands like Caldwell Banker, Ford, and Toyota. Web Talent Marketing, a leading Bing firm based in Lancaster, Pennsylvania, is second on the list. The agency is particularly known for championing PPC as one of its main areas of expertise, with services that also include display network advertising for increasing brand awareness and data feed management for expanding market reach. Other services that Web Talent Marketing offers include SEO, content marketing, reputation management, website design and development, and conversion rate optimization (CRO). Its clients have included Dun & Bradstreet, the Pennsylvania College of Health Sciences, and the National Notary Association. Number 3 on the list of top Bing firms is 7strategycom, which is based in Olathe, Kansas. The agency prides itself in producing catchy ads that are exclusively shown on results pages that Bing generates and consequently drawing lots of website traffic—with minimal amount of money spent. Clients so far have included AT&T, Coca-Cola, and Sony.